Every motorcycle requires a jig to support and accommodate its frame. It is possible to build a chopper without a jig but having it makes the building process a whole lot easier. To weld the chopper, you need a welding fixture. Though it doesn’t hold the frame together for welding, it certainly helps to fit and tack-weld the motorcycle more easily. This item can be purchased from specialized chopper shops but if you are up to it, why not try creating a jig yourself? 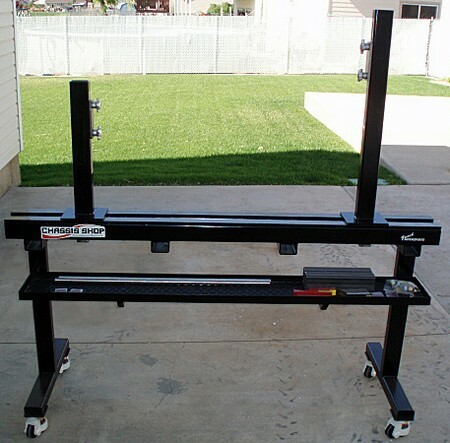 Listed here are some steps on how to build a motorcycle jig. A simple structure can be created with two pieces of 5-inch steel mill channel which functions as the main pieces. They function as the main structure and provide the basic foundation for other parts to adhere to. Having a jig can help achieve a few things- it is able to locate the neck (which includes both height and rake angle that holds it in place). It is also able to locate the rear axle height as well as level the rails located at bottom. For the neck, it should consist of 1/8 inches of wall steel tube measured by 2×3 inches. To clamp the vertical 5-inch steel post, you can use two plates to do so. Then, you can adjust the height of the neck vertically. To follow through the neck of the frame, use a 3/4 inch rod on a pivot. As for the axle post, it is made of 1/4 inch steel tube measuring by 2×4 inches. The item that holds these axle plates are two 3/4 of an inch axles. To keep them in place, you can use shaft collar and spacers. To enable the plate to be jacked up vertically for adjustments, take a 1/2 inch steel plate and attach a 1/2 square tube to it. Make sure that the axle posts can be moved in any direction as needed. Besides that, you can add spacers to the axle and drill bolt holes to set spacing. Certain chopper frames may require specific types of fittings. You should consider the measurements of the frame so that your jog will fit in correctly. The keyword to remember is accuracy. The more accurate it is, the better it will accommodate your frame. For detailed planning and template, you can always obtain more information via different websites. The abovementioned are general steps on how to build a motorcycle jig. Do read up more and come up with a detailed plan so that you will not find difficulty during the building process.